Lafer!Lichter!Funny! (English) - Thomas Anders Online - Die offizielle Fanpage! Only one week after the fantastic 25th International Fanday in Coblence the next show was stepping in. 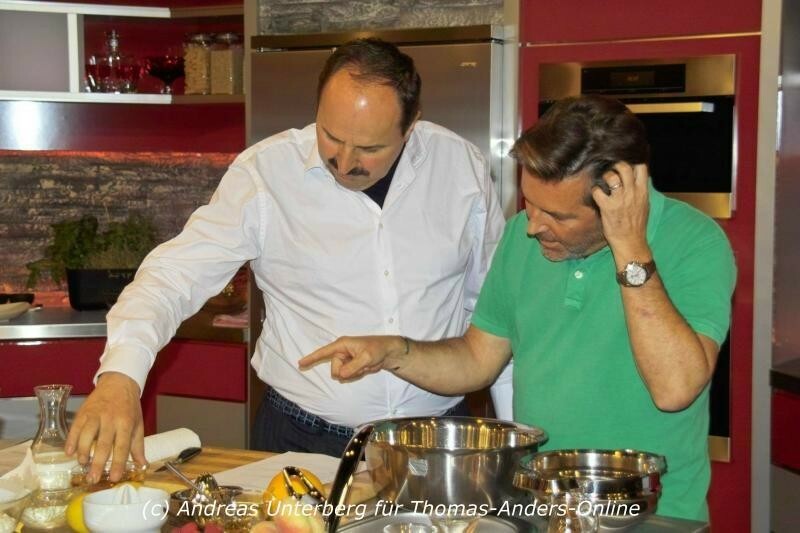 The German television cooks Johann Lafer and Horst Lichter, a funny, officially sworn in Duo on the German television channel ZDF, invited our “Gentleman of Music”, Thomas Anders and the latest winner of Germanies next Topmodel, Stefanie Giesinger to their double kitchen in Hamburg-Altona. The multifunctional production studio from the Fernsehmacher company on the Phoenixhof in Hamburg is always worth it, to make a visit. No sooner said than done, short time later I sat in the InterCity train, direction Hamburg Main Station on that windy Friday. On time and I repeat it…ON TIME, I reached my goal and got some time to take a nice breakfast in the beautiful Hanseatic City. After that I took a cab to go to the studio. 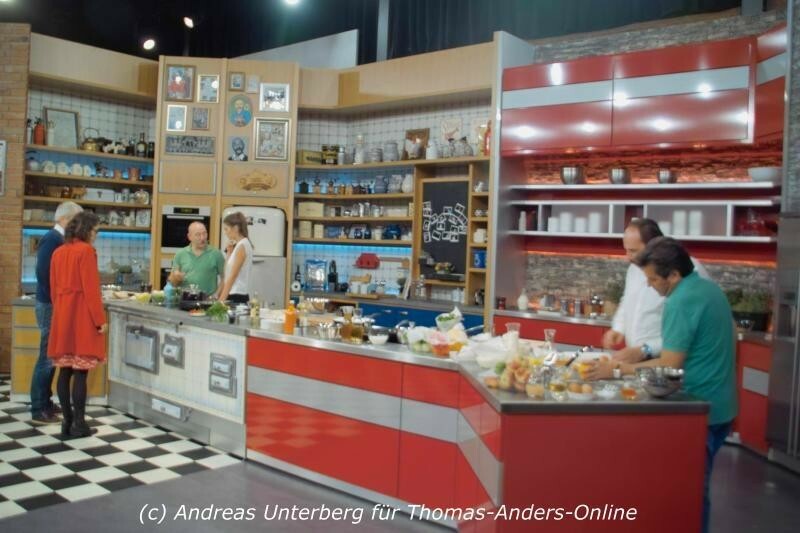 After a welcome drink at the bar in the entrance hall, Thomas rushed upstairs on his way backstage and afterwards to talk about the day plan and the recipes.”Here is the ice machine, here lays the beater, lemons are over there and the peaches you can find in that bowl”, explained Thomas’ cooking partner Johann Lafer. Thomas had to make the desert. “Caramelized vineyard peaches, curd cheese ice and Bellini Sabayon”, sounds very fruity ;-) Meanwhile Horst Lichter was explaining the same things to his partner, the German model Stefanie Giesinger. Thomas was very concentrated on everything and he was trying to feel the quality of the products. So Thomas, which lemon felt tastier? ;-) Recipe: Check! Working equipment: Check! Ice machine: Check! Now, quickly shooting some photos for twitter and then some makeup and hair styling for looking good on TV. Meanwhile the people outside started to enter the studio and took their seats. So relaxed, that the entrance only lasted 20 minutes. The Warm-Upper praised the audience for being the best-looking audience ever and for their applause in the beginning. Such a yes-person. ;-) Than the show started, cameras in position, lights in initial.”It’s not unusual” from Tom Jones was hearable and Johann Lafer started his moderation. The audience still doesn’t know which artists are cooking together until they come in. This caused a real “ahh” and “ohh” effect.”Do you know Bernd Weidung?” Yes, of course .”Would you believe me, if I tell you that Bernd Weidung sold over 125 Mio. records? Suuuuure . But I was the only one until they heard the name Thomas Anders. Than the audience murmured understanding. Thomas and Stefanie came in, in a good mood and not stressed. But Thomas had any reason to be stressed, because his return flight was so close to the ending of the show that he has to hurry a bit with the press photographers. While Thomas froze his ice down to lower temperatures, cut his peaches into filigree pieces and moved his pan slowly over the cooking plate, there was much talking and much laughing throughout the whole show. The detailed progress of the show? Just funny, entertaining and informative. From Sotschi to the Kremlin Palace, from depilatory to the new Duo “Modern Cooking”, from the casting of saddle of lamb to the catwalk. Also very funny, the way Claudia always calms down Thomas, when he is coming home from a Russian tour and is still in the 7th heaven. 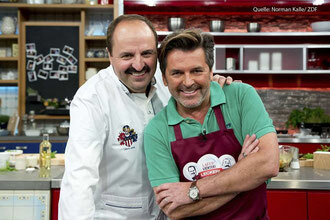 All that later, at 16:15 local German time, on channel ZDF, on Lafer!Lichter!Lecker. Enjoy yourself while watching and reproducing from Andreas Unterberg. Recipes from Johann and Thomas can be downloaded beneath.